In this video we will show you how to make a very powerful homemade fire extinguisher. We insist that a real one is much better but it is possible that you don’t have it or you don’t have acces to it so it might help you. This homemade fire extinguisher will not put out all fires, such as grease fires, that is why having a fire extinguisher is a good thing. Just note as well that this extinguisher is no good for long term storage, it is more of an experiment, so you should rely get a small extinguisher to have on hand. What do I need to do a homemade extinguisher? 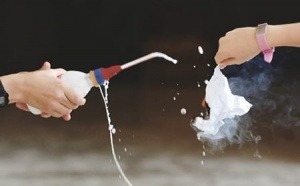 How to do a homemade extinguisher?